From Kuala Lumpur International Airport (KLIA), there are several transportation options to travel to the city center of Kuala Lumpur. The fastest way is to take the train service either KLIA Ekspres or KLIA Transit. KLIA Ekspres is slightly faster than KLIA Transit because it travels directly to KL city while KLIA Transit stops by several locations first before going to KL Sentral, Kuala Lumpur. Other options to get from KLIA to KL Sentral include bus service and taxi services. The departure point from KLIA is located at the KLIA Ekspres in Level 1 of the KLIA Main Terminal Building. KLIA Ekspres uses Platform A and KLIA Transit uses Platform B. The arrival point is at KL Sentral, which is a transportation hub that connects many public transportations available in KL city. Upon arrival from KLIA to KL Sentral, you can choose to take LRT, KTM train, RapidKL bus, monorail or taxi to get to your hotel or travel to the next destination. KLIA Ekspres train from KLIA to KL Sentral Kuala Lumpur has a frequent schedule. The service is available every 15 minutes during peak hours and every 20 minutes during off-peak hours. Due to the less crowd after midnight, train from KLIA to KL Sentral availability is reduced to every 30 minutes. The first train from KLIA to Kuala Lumpur starts at 5:00 AM and the last train departs at 1:00 AM. Online ticket purchase is valid per one entry for the whole day and you can board the train at any departure time on the selected departure date. 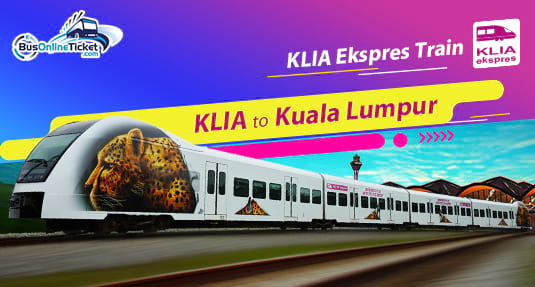 You can easily book your KLIA Ekspres train tickets online to travel from KLIA to Kuala Lumpur at BusOnlineTicket.com, an authorized partner of KLIA Ekspres. Booking confirmation will be sent to your email once we receive the payment. Printing the ticket is not compulsory as long as you can scan the QR code from the booking confirmation email to the QR code reader on the gate.